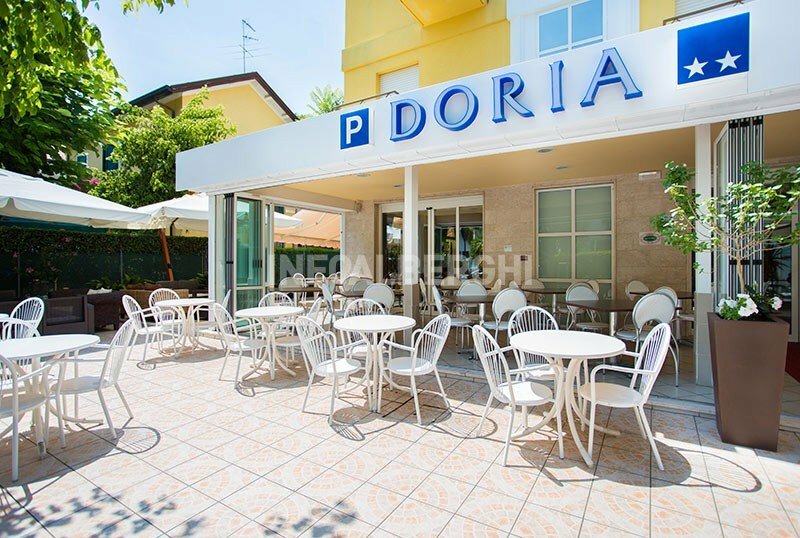 The Hotel Doria in Riccione offers a family atmosphere and many services including WI-FI, parking and lots of attention for the little ones. No pets allowed. This hotel adheres to the Green Booking project and has decided to donate a tree to the coast for a healthier environment and a more sustainable tourism. The hotel is located in Riccione in a shaded area close to the sea, near the thermal baths and the most interesting places in the area. The position allows you to move easily on foot or by bike without ever using the machine. The rooms have beds with slatted frames, orthopedic mattresses, high and low cushions, hypoallergenic fabrics, telephone, satellite TV and flat-screen digital terrestrial, individually controlled air conditioning, safe, WI-FI, private bathroom with shower and phon. Almost all rooms have a balcony. Garden, open-air porch, free bicycles for adults and children, panoramic lift, newspapers in use, small library, games room. PARKING: scopero until places are exhausted, in the hotel and at 500 mt. AIR CONDITIONING: also present in the room on an all-inclusive basis. CONVENTIONS: beach, thermal baths, amusement parks, spas (free admission to the Perle d'Acqua spa park in all inclusive). BREAKFAST: sweet and savory buffet, with homemade cakes, set up in the garden. LUNCH AND DINNER: wide choice of appetizers with 25 courses arranged on 2 buffets. Vegetables and side dishes accompany two choice menus with homemade pasta, meat or fish. In the hotel: large outdoor playground area visible from the dining room and with the possibility for parents to have lunch outside, TV room with a small playroom and library where you can watch cartoons or indoor games, strollers, bicycles, pediatric assistance , babysitter. In the room: cots and tubs for the bathroom. At meals: high chairs, cutlery, early entrance at 12 or 12.30, baby menu, "mothers corner" with microwave and refrigerator. For the little ones, moreover, vegetable or meat broths are prepared (starting from fresh ingredients and without artificial flavorings), delivered directly to the mothers and stored with a label in the fridge to be consumed when needed. The hotel has an agreement with the area n.56 Bagni Renato and area n.59 Bagni Cicca, where guests find entertainment, hydromassage and games for children. Weekend € 35.00 in B & B minimum 3 days ..
Free sea with 7 days. We are just 50 meters from the beach, a few steps from the Terme di Riccione and the famous Viale Ceccarini. A choice between: B & B, Half board, Full board and free air conditioning in all treatments. Double menu to choose between fish and meat and complemented by a large buffet of 20/25 appetizing appetizers! Special parking price for only € 8 per day. Discounted tickets for the Riviera's amusement parks. - Stay in cozy rooms full of every comfort. - Air conditioning wi-fi and use of bicycles all for free. - Start the day with a rich sweet and savory buffet breakfast all at will. - Reach the fair in a few minutes by car or if you prefer the train stops right outside the entrance and the station is just a few minutes from our hotel ...! Leave your car safe in our private parking for just € 8 a day. Weekend € 55.00 in B & B minimum 3 days ..
Complimentary admissions to the Water Pearls Park with 7 days. Double menu choice between fish and meat and complemented by a large buffet of 20/25 appetizing appetizers. Special parking price for only € 9 per day. Weekend € 45.00 in B & B minimum 3 days. Complimentary admissions to the Water Park with 7 days of stay. B & B, Half board, Full board and free air conditioning in all treatments.